JPI Healthcare Solutions works with manufacturers around the world to bring cost-effective digital radiography solutions to our dealer network and their customers. Our flat panel detectors are no exception to this rule. JPI's flat panel detector partner excels in developing and manufacturing high performance Cesium Iodide (CsI) detectors, and offers a complete line of fixed, portable, and wireless solutions. These CsI plates aren't purchased from another party and glued in like other suppliers do. Instead, these detectors contain CsI which has been grown directly on the flat panel substrate. This direct deposit technology results in outstanding efficiency from x-ray to visible photon, excellent spatial resolution, and stability. 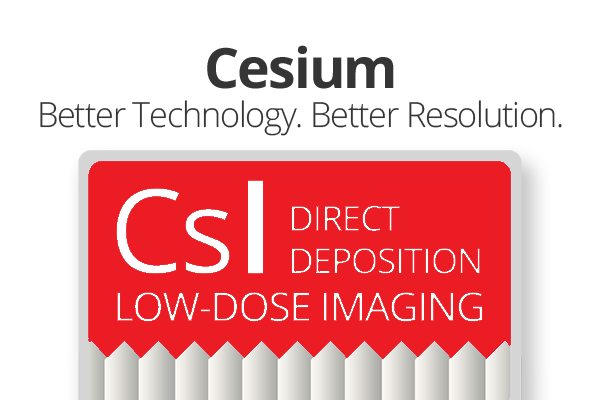 With JPI as your detector supplier, lower dose and higher image quality can be achieved at an affordable cost.